We had a wonderful 4th of July long weekend, reconnecting with family! In spite of the dreary weather. We managed to enjoy walking along the Nantahala River, two camp fires here at the cabin, white water rafting (a great ride since the water was very high cause of the rain), hiking at the deep creek loop trail and seeing the waterfalls. We also enjoyed sitting on the porch and talking. The cabin was just what we expected and a great place for us to reunite. Our family of 5 loved staying in the cabin on our way to Michigan. Lots of fun adventures and a great place to call "home base" Maybe this will become an annual tradition! We loved the cabin. We has a great 3 days! 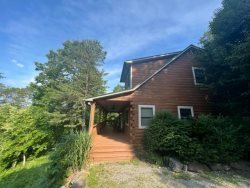 I would recommend this cabin to anyone because its private and peaceful yet close to all points of interest, nice and very clean and still affordable great cabin to kick back and relax at! Thank you for a beautiful relaxing weekend. Wish we could have stayed longer. Dot and clan stayed here. We really enjoyed the peace and solicitude. The weather was beautiful. We took in the sites, first going fishing at Cooper Creek Trout Pond. We came back to the cabin and cooked the trout. The next day we went to Nantahala to do some whitewater rafting. The weekend was a happy and fun time. We stayed here for a very memorable weekend. On our first ride it started snowing and we made our way back to the cabin in 2" of snow. A total of 8" would fall over the weekend, cancelling our Sunday ride. We still had a great time.